MYANMAR: Opium production in Myanmar has “stabilised” at stubbornly high levels, the United Nations said recently, adding the government must address poverty and end the conflicts which drive farmers to grow illicit poppies. Myanmar, the world’s second largest opium producer after Afghanistan, has struggled to stem the tide of narcotics from its remote and violence-scarred border regions despite political reforms that saw Aung San Suu Kyi’s opposition party win historic elections in November. “The region’s demand for heroin remains at unacceptably high levels and transnational organised crime groups are making huge profits,” said Jeremy Douglas, Southeast Asia representative for the UN Office on Drugs and Crime. Much of Myanmar’s opium feeds demand from China’s more than one million heroin addicts, but the country is also increasingly getting hooked on its own product. In the 1980s Myanmar was the world’s largest producer of opium. It was overtaken in the early 1990s by Afghanistan, which now accounts for 80 per cent of global production. But Myanmar’s poppy cultivation has doubled since 2006, while cartels now also churn out millions of methamphetamine tablets. UNODC in its annual report that Myanmar opium production levels were roughly stable from 2014 at 647 tons, down from a peak of 870 in 2013 when yields spiked despite a Myanmar government pledge to eliminate illicit crops by 2014. Mr Douglas said that while the “stabilisation of poppy cultivation in the past year is encouraging” in Myanmar and Laos – which produced up to 176 tons – the governments of both nations must “face the underlying issues that allow opium cultivation and related trafficking to continue”. In isolated and mountainous ethnic minority states, particularly Shan and Kachin on the frontiers with Thailand and China, farmers grow opium as a quick way to get money for basic household needs. 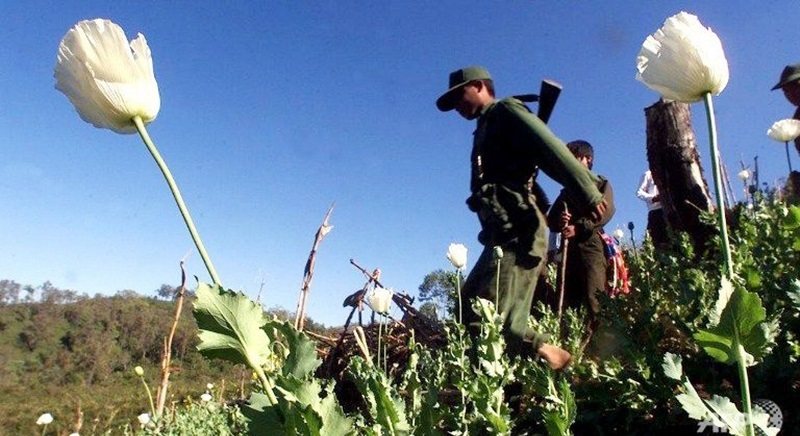 Shan state, which is home to a number of ethnic armed groups and government-backed militias, accounts for 91% of all opium poppy production in the Golden Triangle region covering parts of Myanmar, Laos and Thailand. Village leaders surveyed by UNODC said buying food was the main reason for locals to cultivate opium. “The large majority of opium farmers are not rich and grow it for their survival,” the Myanmar Opium Farmers’ Forum said in September, when representatives from across the affected states called for eradication efforts to stop until people could find alternative incomes.